It is strawberry season in Florida, which means we have the most amazing, sweet, fat strawberries available to buy in our grocery stores and local farm markets. I’m told due to weather conditions, that strawberries are even sweeter this year than usual, and I cannot say I notice a difference, though they are delicious. It is been unusually warm here in Florida since the new year began, so I have not been in the mood for my usual hearty bean and vegetable soups for lunch. With the weather this warm, a lovely crunchy salad is the perfect option for a light lunch, and as well as fresh vegetables, I like to add grains and nuts to my salads for both texture and added nutritional value. Quinoa is quickly becoming a new favorite in our house, and I love the texture it adds to salads. If you are not familiar with it, quinoa is an remarkable ingredient and is not a grain, but a seed, so is gluten free. It is also a complete protein containing all 8 essential amino acids and is a good source of iron, phosphorous, magnesium, calcium, vitamin E, and folic acid so you can see why some consider it a superfood and why it is becoming more and more popular. Although quinoa is not easily found in Italy, I have recently discovered it being sold at local health food stores, as well as in the organic and health section of larger grocery stores. 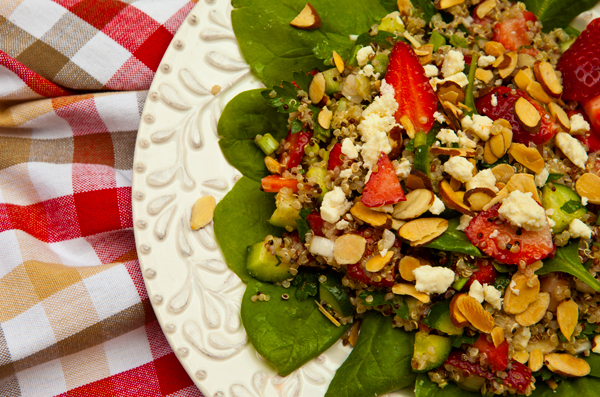 I had just bought a quart of local strawberries, so decided I’d add them to some cooked quinoa along with some crunchy vegetables for a tasty lunch salad, and we enjoyed it so much, I’m sure I’ll be making it often while strawberries are in season. This salad will serve four as a starter or appeptizer, or two as a main course salad. To cook quinoa, place 1 cup dry quinoa in a strainer and rinse well. Place the quinoa in a pot with 2 1/2 cups of water. Bring mixture to a boil, cover with a lid, then reduce heat to a simmer and cook for about 15 minutes. Turn off heat and let sit 5 minutes, then fluff with a fork and cool to room temperature. Strawberries are rich in flavonoids that help counter cell damage reducing the risk of cancer and cardiovascular disease. As well, strawberries contain important antioxidants that help reduce inflammation. 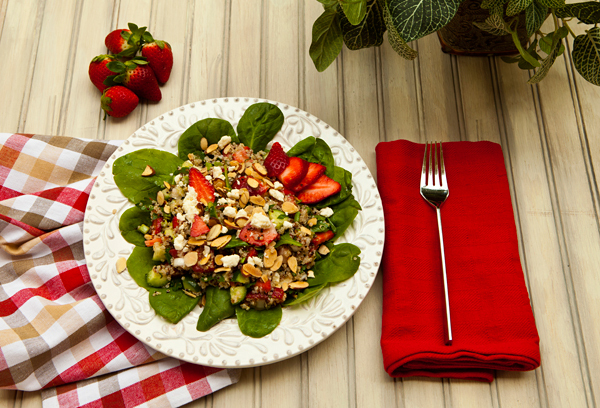 In a large bowl, mix together the cooked and cooled quinoa, cucumbers, strawberries, onions, parsley and mint leaves. In a small bowl whisk together the dressing ingredients. Pour over half the dressing on the salad ingredients and toss. Taste, and add as much additional dressing as needed. Arrange the baby greens on individual plates or a platter and then spoon the quinoa salad on top. 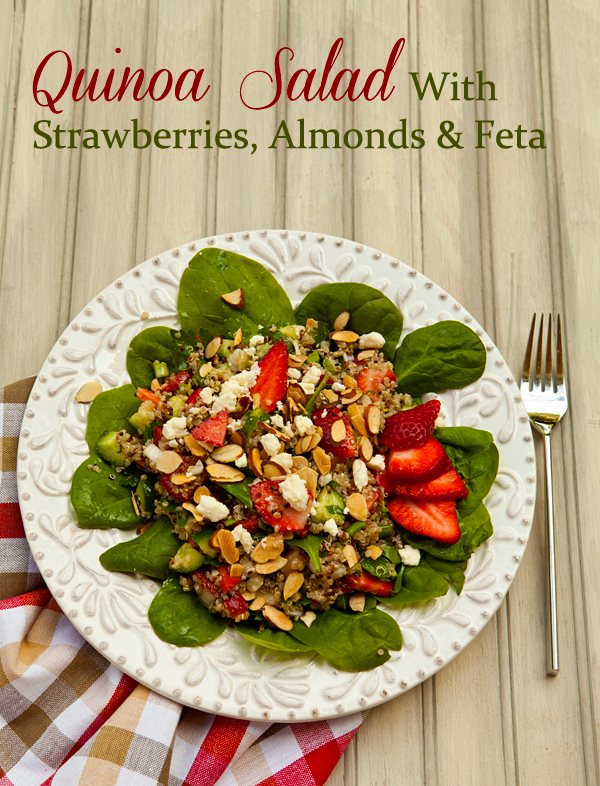 Sprinkle the almonds and feta (or goat cheese) on top of the quinoa and serve immediately.